"By making photographs, they are tools with which one can express their personal taste and private sensibilities. At the same time they physically exist as expressions of these same concepts. The relationship one has with their cameras affects their approach to making a picture. 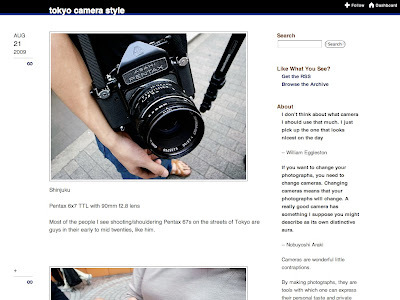 People who shoot film simply do because they choose to, and the Photo Culture of Tokyo is full of film camera users. When I meet them out on the streets I ask to photograph their camera, and usually post it here the same day../"
Oh and btw... if you don't dip into The Sartorialist then you should... their street portraiture is awesome, imho.